Stephen Kershnar's take on torture is unique for four reasons. First, it provides a distinct analysis of what torture is. Second, it argues that on non-consequentialist grounds, specifically rights-based ones, torture is sometimes permissible. Third, it argues that torturers are not always vicious. Fourth, it argues that it is plausible that these conclusions apply to some real world cases. In short, it fills the following gap: it evaluates torture from a rights-based perspective and finds that in some cases it is permissible. 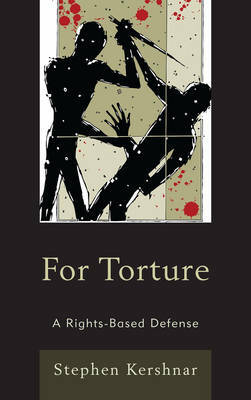 Kershnar's moral evaluation of torture sharply differs from the rest of the literature. The evaluation focuses on the non-consequentialist approach to morality, that is, it assumes that what makes an action right is not solely whether it brings about the best results. Using the central feature of non-consequentialism, moral rights, Kershnar argues that torture is justified in a number of theoretical contexts, including defense, punishment, and when the person to be tortured consents. He then looks at the actual world and argue that it is plausible to think that there are real-world cases where torture is justified. Kershnar's analysis also looks at whether torture is virtuous in an attempt to get at what intuitively repels us about torture. His analysis is not only the first look at the issue, but it also ties in with recent developments in virtue theory. As in the analysis of the permissibility of torture, he tries to show that my findings with regard to virtue are not merely of theoretical interest, but are plausible given some real-world cases.